This is my first photoshoot without my sister-in-law/photographer PK (if you recall, she and my brother are travelling around the world for a year!) It is also my first photoshoot since I chopped off half my hair! 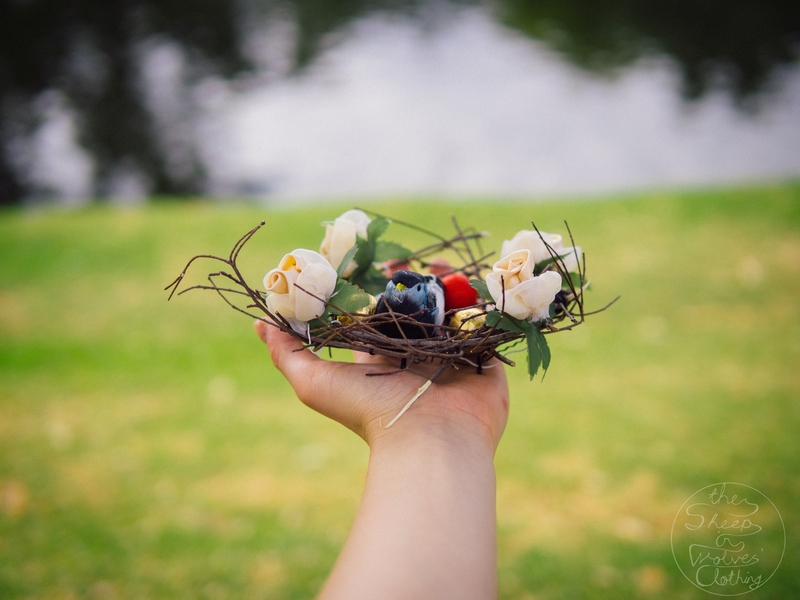 (My hairdresser nearly had a heart-attack when I asked her, but that’s another story) We took a few photos using the birdnest as a prop, and also with me wearing it properly as a fascinator. I used twigs from our hedge, choosing stems that were still slightly green and flexible for me to manipulate. The bird is a leftover from my 2015 DIY Avian Flowercrown, while the golden silk roses were from the DIY fake flower headband I made years ago as a teenager! Similarly, the Easter eggs actually aren’t eggs but are in fact chocolate spheres. 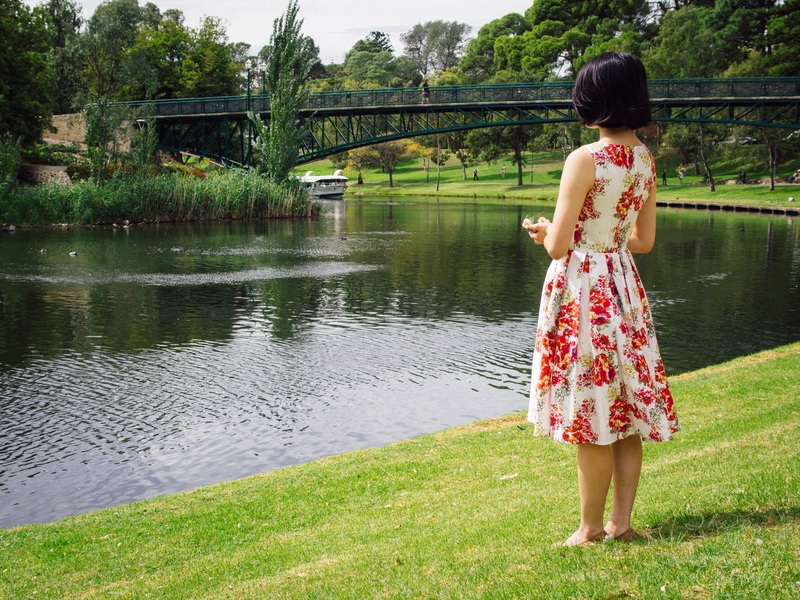 I was dying to wear this particular dress for the photoshoot (I bought it with my mum on sale at Laura Ashley and fell in love with the classical silhouette, full skirt and the pockets!) I don’t normally wear midlength skirts (because I have short calves, they’re not as flattering), but I think one shouldn’t be limited by vanity or self-consciousness from wearing something you really like. Besides, it’s perfect for twirling! Whenever I do photoshoots, I have in my mind a certain feeling/theme I want to capture. 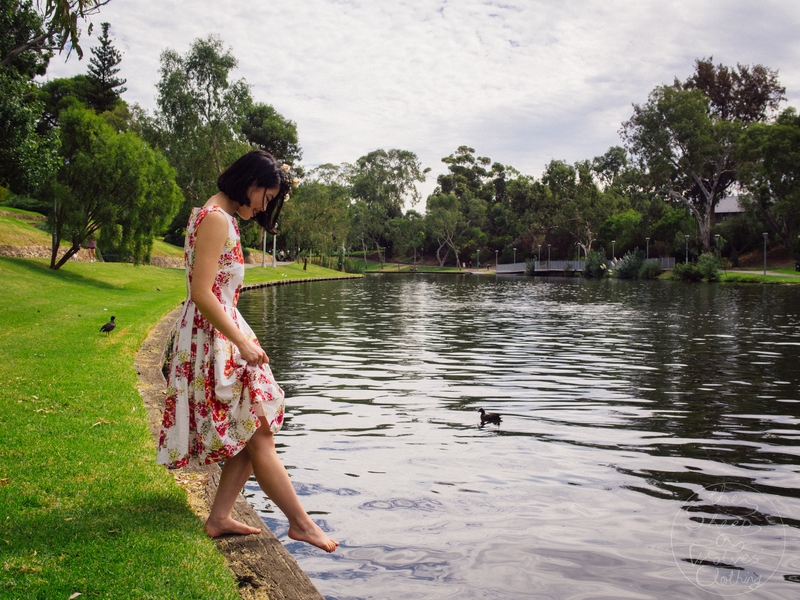 This one is a bit playful and a bit old-fashioned with the vintage-style dress and the classic red lip; as I look at the photos afterwards, the boathouse, the green grass and the river remind me of when I visited Oxford in the UK. Very fitting for something photographed next to the university! All in all, it was fun to do! My boyfriend isn’t a photographer, but I think he performed quite splendidly in lieu of my sister-in-law! They are currently in Brazil- you should watch their videos!